It really is hard to beat a good old-fashioned cheeseburger, but sometimes we don’t want the hassle of firing up the grill or hand forming several individual patties. That’s where this burger-meatloaf-hybrid comes in handy! The trick to a moist and tender meatloaf is to not overwork the ground beef mixture – it also helps that we stuff ours with a hearty amount of cheddar and wrap it in thick strips of bacon, making it juicy and delectable. If you’ve got a group to feed (or just a really hungry family like ours) you’ll love how effortless it is to get all that delightful bacon cheeseburger flavor in one easy recipe! Add ground beef, breadcrumbs, milk, egg, ¼ cup ketchup, worcestershire sauce, steak seasoning, garlic, cayenne, salt and pepper to a large bowl. Combine ingredients by hand until just incorporated - do not overmix! Lightly pack mixture into a ball and transfer to a lightly greased loaf pan, gently pressing meat to form a flat, even loaf. With your fingers, dig a trench for cheese down the center of loaf. Fill with grated cheddar. Be sure to leave room at the top of the trench, and seal the meat pocket shut. In a small bowl mix together remaining ketchup and brown sugar. Drizzle half of mixture over top of meatloaf. Lay strips of bacon evenly across entire loaf top, tucking the ends around side of loaf to prevent curling, and top evenly with remaining glaze. 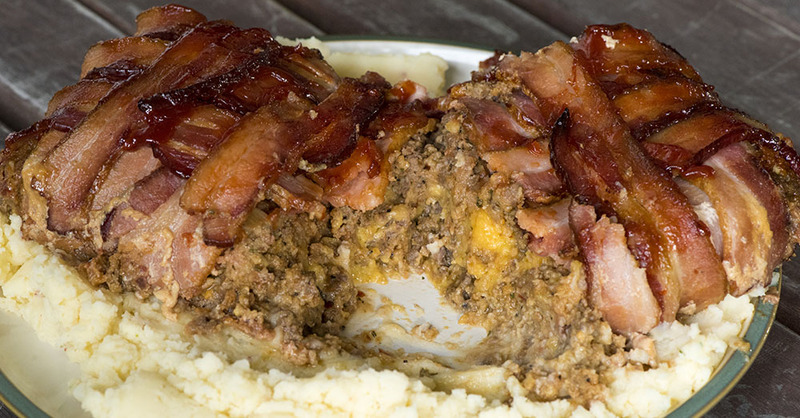 Bake meatloaf until thoroughly cooked and bacon is crispy, 50-60 minutes. Let cool for 10-15 minutes. Serve warm and enjoy!